We are Scaffold Banner specialists, dedicated to the scaffolding trade and have been providing custom printed Scaffold Banners throughout the UK for over 10 years. Our most popular size is the 1 metre square scaffold sign, but we can make 1 x 2 metre. 1 x 3 metre or even 1 x 4 metres. All our Branded Scaffold Tower Banners have material double sided for extra thickness. This prevents the sunlight shining through and showing the back of the print from the reverse and ruining your advertising. (VERY IMPORTANT). Also all our Scaffold Company Signage is double stitched all the way across the banner around the pole loops. This gives it much more strength, whereas many other personalised scaffold banners are not and they will rip or begin to break off after just a few months use. After all, lets face it, they get hammered every day high up on buildings in strong winds taking all the British weather throws at them. 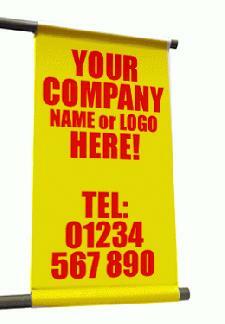 Contact us with your Scaffold Banner enquiry and we will be happy to get you prices.